Blue Origin Is Testing Reusable Rockets. Here's Why You Rarely See Them. Blue Origin is worrying about Blue Origin. That's it. 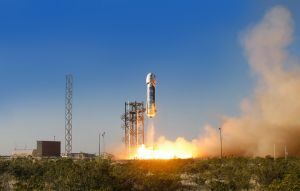 On Sunday, April 29, space travel company Blue Origin launched a test of the New Shepard reusable rocket and the space capsule that the company hopes will one day transport tourists to the edge of space. It was the eighth such test of this rocket design, and the second for this particular rocket. Yet unlike the PR-heavy, live-streamed fanfare of SpaceX launches, this is also only the second time Blue Origin has made one of their tests available to the public in real time. Why so secretive, Blue Origin? “Space is a big place. It’s not a zero-sum market,” Caitlin O’Keefe Dietrich, Blue Origin’s Head of Public Relations, told Engadget when asked whether the company felt any pressure to speed up testing based on the achievements of competitors like SpaceX and Virgin Galactic. “Our philosophy is to use an incremental, step-by-step approach for our long-term space technology development programs. And this approach has yielded us a lot of progress thus far,” Dietrich added. Rough translation: Blue Origin doesn’t give a damn about SpaceX’s media circus. It’s not trying to outdo competitors with each subsequent project — the company is working on just two rockets (New Shepard and New Glenn) with hopes to launch a manned flight before the end of 2018. Blue Origin is worrying about Blue Origin. That’s it. It’s a bit too early to tell whether Blue Origin’s strategy is any better than SpaceX’s, or vice versa. Competition is a powerful force for innovation. But with the commercial space industry quickly growing (and SpaceX threatening to monopolize it), it’s easy enough to keep innovating in an effort to one-up the competition, losing sight of the main goal in the process. Still, in the short term, the companies are still hungry to grow. Blue Origin is currently competing for a contract to develop a new orbital-class rocket for the U.S. Air Force. It’s also unlikely that Blue Origin will keep their process this quiet forever. After all, if the company wants people to purchase a ride on their forthcoming low-orbit flights, it’s going to have to get them excited to fork over the cash.